Hustlers, grinders, and multi-taskers, please meet your new business model (no pun intended). DJ Kiss, nÃ©e JaKissa Taylor, is a triple-threat model, record slinger, and sometimes actress brimming with ego-free talent, who delivers with modesty and intelligence. Having spun records for the likes of Nike, Versace, Armani, Vitamin Water, and Sean â€˜Diddyâ€™ Combs, as well as graced the pages of Essence and 944 Magazine, Kiss has attained that G4 lifestyle that most can only feign in bar-room discourse or rap lyrics. Format caught up with the Louisiana-born Taylor one blustery fall afternoon to discuss hierarchies, â€œBad Boys,â€ and her next move. Format: How did you get into spinning records? Modeling? Kiss: Youâ€™re either a DJ, or youâ€™re not. Iâ€™ve been into the technical aspect of it since I was little; making tapes et cetera. I was heavily influenced by the club sounds of the 1980s. I used to have conversations with DJ M.O.S., who was kind of my mentor, about music. One day he was like, â€˜Iâ€™m gonna teach you how [to DJ].â€™ I just celebrated my three-year anniversary. As for modeling; I moved to New York, Iâ€™m over 5â€™ 9â€, so I just sort of stumbled into it. I was doing public relations in the same building as an agency and ended up working with Fubu, Everlast, and Essence Magazine. Acting was in the middle, as I had to work red-carpet events occasionally [with the PR company], and also went on casting calls. Format: Tell us how you linked up with The SKAM Artists. Kiss: I was looking for management, and everywhere I turned it was the same thing. I got in contact with Sujit Kundu (of SKAM) and it just kind of came together. They keep me busy; I recently did a full-page spread for 944 Magazine. Format: Do you feel that you have a cross to bear, being a female DJ and fashion icon? 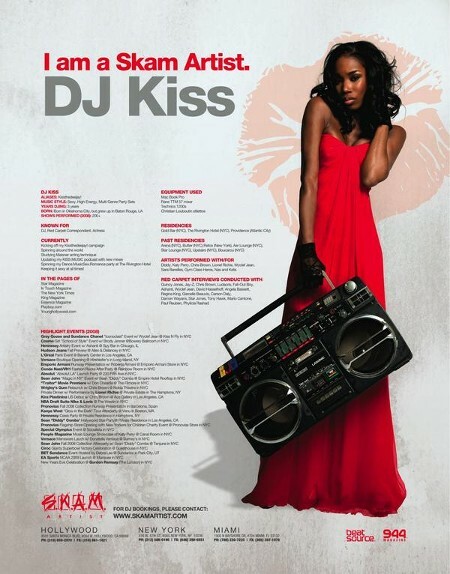 Kiss: Initially, I did, because female DJs are perceived as eye-candy who just play off of their iTunes. There are definitely lower expectations, but Iâ€™m alright with that, because they never see me coming. Format: How difficult was it to ascend the ranks in the DJ world? Kiss: It was difficult, but it helped to have good management, a passion for it, and good marketing [techniques]; my first name is JaKissa. DJing is also a business, which means rolling out of bed with three hours of sleep. Format: What is it like playing at all these huge corporate events? Kiss: Quite manageable, actually. At corporate parties and product launches, there isnâ€™t much focus on music; itâ€™s more of an abbreviated club experience. All eyes are on the product; people are more concerned with getting their free Blackberry [laughs]. Format: Diddy named you one of his top three DJs to work with; you must have a story. Kiss: Heâ€™s a consummate gentleman. I played a party of his called â€˜Harlemâ€™s Hollywood,â€™ in the Hollywood Hills. I was in this room that overlooked the whole dance floor, and it was very challenging because there was no crowd feedback or direct contact. At one point, Diddy came up and said to me: â€˜I know you canâ€™t see whatâ€™s going on, but youâ€™re killing it.â€™ It was such a compliment. Format: What has been your favorite city to play in thus far, and why? Kiss: Las Vegas, definitely. It is like New Yearâ€™s Eve, 365 days a year. People party a lot and they drink a lot [laughs]. Format: Do you have any advice for aspiring females in the either of the fields youâ€™re involved in? Kiss: Do study your craft. [Regarding spinning records:] research your genre, and study music, including the classics. DJing is one of the few professions that require no [prerequisite] skill set. Be passionate and focused. Donâ€™t compare yourself to others; be the best, period. Format: Where do you see yourself in five to ten years? Kiss: Managing all my different projects, scoring film, hustling, making more music, working more red carpet events, finding love, and marrying. 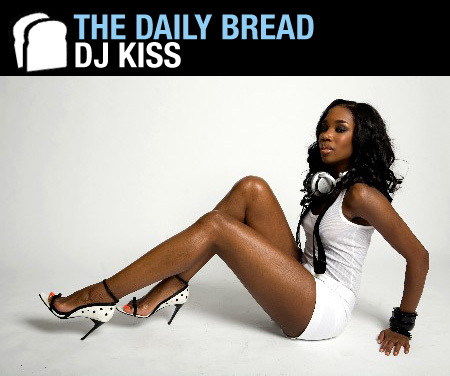 For more information on DJ Kiss, please visit her Myspace page or check out one of her Podcasts. One of the hottest DJ’s around without question.